Many bodybuilders have seen good results from following ketogenic diets. Known as an LCHF (low carb, high fat) diet, keto is designed to force the body to get its energy from ketones the liver produces from fats, instead of from glucose the liver produces from carbs. If you can sustain the diet long enough for your body to enter ketosis, you can lose some major body fat. That said, you can't remove all the carbohydrates from your diet and expect to continue your workouts as usual. You do. Glucose provides the primary fuel source for intense muscular contractions. Whenever you're sprinting, going for your set of max squats, or performing box jumps, your body is burning through glucose to fuel that effort. The keto diet is defined as a dietary approach in which you consume 65 percent of your calorie intake from dietary fats, 30 percent from protein, and just 5 percent from carbohydrates. As you can see, this is an exceptionally low-carb approach to eating. The idea behind keto is that in response to a drastic reduction in carbohydrates, your body creates an alternative fuel source called ketone bodies. Ketone bodies are a perfectly good fuel for many activities, just not for sustaining an intense exercise program. 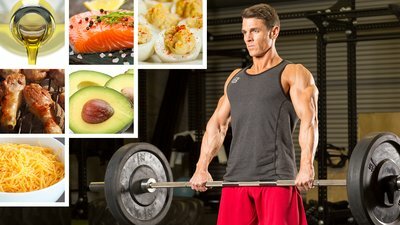 Why are you interested in keto? Do you just want to lose body fat? Do you want to achieve and maintain a healthy body weight? If either of those sounds like you, you might do better by cutting back on your regular exercise program and spending more time focusing on creating and following a rock-solid nutrition plan. Get your eating down first, then start hitting the gym. For some people, this nutrition-first approach is the easiest and least complicated way to start shedding weight. Go for a few long, brisk walks each week to sustain a base level of physical fitness as you improve your diet. Once you've got that nailed down, resume your intense strength-training program when the diet ends. If you don't want to shortchange your strength workouts, you at least need some alternatives. One of the better options is to simply modify your keto diet to a targeted keto diet. In this approach, you follow the same ground rules as with the keto diet plan, but you add carbohydrates directly before your workout. Eating carbs then will give your body the glucose it needs to successfully complete the workout session—and to adequately replenish your muscle glycogen levels once you finish. Opt for simple carbs at this meal. This might sound counterintuitive, but it's the fastest way to put some pure glucose into your system. A burst of glucose will quickly take you out of ketosis and provide quick energy for the workout at hand. This approach will also enable your body to quickly clear glucose from your bloodstream so you can go right back into ketosis. Dextrose or maltodextrin will likely be your best bet for a simple carb, but you can also use things like sugary cereal or similar foods. On off days, you'll simply maintain the standard ketogenic diet. Since you aren't needing glucose to power through intense exercise, there's no need for adjustment. If you are trying to lose some major body fat and are following this approach, make sure you're accounting for these extra carbs as part of your total daily calorie intake. When you consume more carbs, you must also cut back on your fat consumption. If you don't want to eat more carbs, choose MCTs before your workout. You can get your MCTs from coconut oil or coconut milk, or from medium-chain triglyceride oil. Your body can break down this form of dietary fat fast enough to give you the energy you need for your workout, as was suggested by research appearing in the International Journal of Sports Nutrition. It may even give you a bit of an extra energy boost as you head into your workout, enabling you to exercise with greater intensity. The only downside is that some people report gastrointestinal complaints when they consume MCTs. It just depends on how your body reacts to them. Finally, re-examine your current exercise protocol. When you're getting your fuel from a few extra carbs, you might be able to do your usual high-volume lifting session, completing set after set of all the major lifts. If you take the MCT approach, you may need to lower your objectives a bit. In any case, make sure your body has had a chance to adapt to your keto diet before you continue the current strength-training program. Once you are fully adapted, your body can use fats for fuel better than it does glucose when you do moderate-intensity work. It may take you some time to become adapted to the keto approach, so don't rush into exercise too soon. You'll also want the overall intensity of your workout to come down. As noted, ketosis supports moderate-intensity exercise better than it does high-intensity exercise. Metabolic conditioning such as treadmill sprints may be incompatible with your keto diet. Reduce the overall intensity of your lifting sessions by either doing fewer reps per set or lifting less weight. Most people respond best to lifting less weight, since ketosis supports endurance training quite well. A lighter weight with a higher rep scheme falls more along this line of programming. If you don't take the weight too light, you can still maintain lean muscle mass. Going on the ketogenic diet doesn't mean you should avoid exercise. Put some time into thinking about what type of exercise you want to perform when you're doing keto, then look at ways you can do them in a more moderate but still challenging way. It is possible! Berning, J. R. (1996). The role of medium-chain triglycerides in exercise. International Journal of Sport Nutrition, 6(2), 121-133. Jeukendrup, A. E., Thielen, J. J., Wagenmakers, A. J., Brouns, F., & Saris, W. H. (1998). Effect of medium-chain triacylglycerol and carbohydrate ingestion during exercise on substrate utilization and subsequent cycling performance. The American Journal of Clinical Nutrition, 67(3), 397-404.